Before long, televisions as we know them will be no longer. There is no doubt that flat panel technology is better than the tube TVs we used to live with, but we can do better. We realize that this is a pretty outlandish claim to make. But we have a good reason for it. Flat panel televisions are an outlier. Projection technology has been around for decades, and is still in use today. Cameras, for example, share a lot of common components with modern projectors. In fact, even our eyes are similar in design to projection technology, just in reverse. The simple fact is that projection is the most natural way to display an image. As technology improves, we expect to see projection technology become more commonplace in our lives. In some ways, this is just wishful thinking. 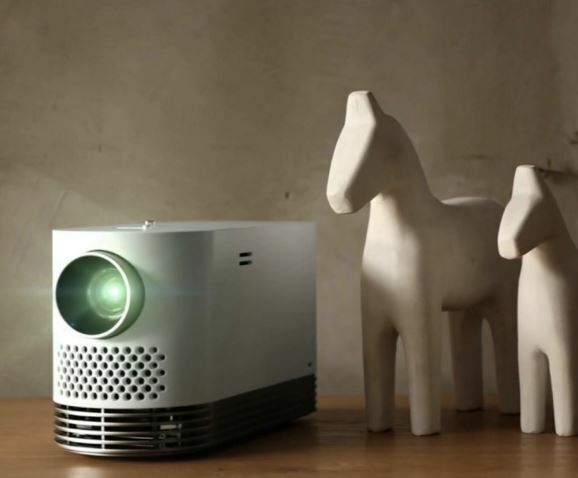 But LG has just released a projector that implies the video technology of the future is available today. This projector is unique because it uses lasers instead of your typical LCD system. 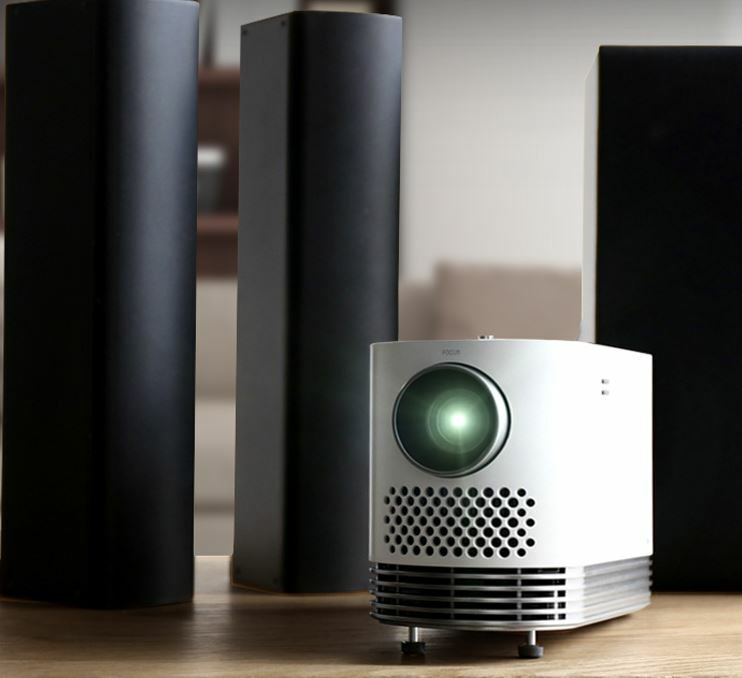 While this isn’t the only projector to experiment with this kind of technology, it’s certainly one of the most affordable. Let’s go hands on and see if this unique piece of hardware is ready for prime-time. 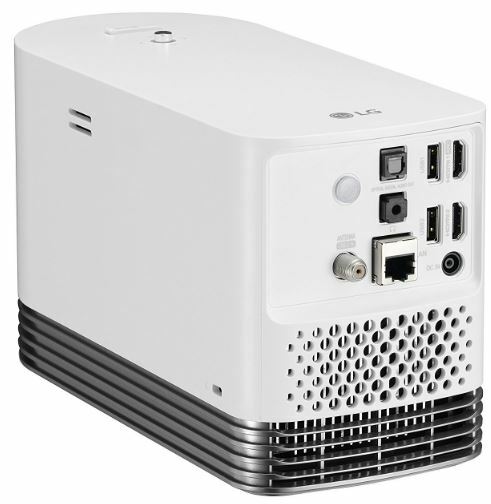 The first thing you notice about the LG HF80JA Laser Smart Home Theater Projector is the size. It’s a little smaller than a football, and shaped much differently than you’re used to seeing. This is because typical projectors use three separate LCDs, which are combined using a prism. But because there is only one image source in this model, LG was able to make it much more compact. The design almost has a retro feel to it, featuring a cooling grill that runs the length of the base, and several additional holes in the rounded face, right below the lens. The top features just a simple button, which is actually quite advanced in design. It serves two functions. By pushing it in either direction, it operates as a d-pad. By pushing it in the center, it acts as a button. 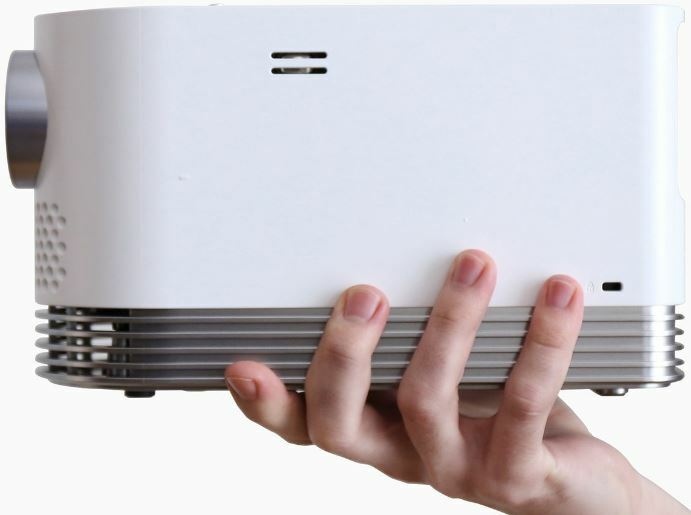 This single unit can control the entire projector, which makes it very easy to use. Most projectors are pretty simple. You hook up a video source, and it plays it back. Although the HF800JA has all of the connections we look for, there is one particular feature that stands out. It has a tuner. It’s capable of receiving over the air HD streams (with the appropriate antenna) and streaming content over the network. This might seem simple in principal, but these two features require both a processor and the appropriate decoding chipsets. 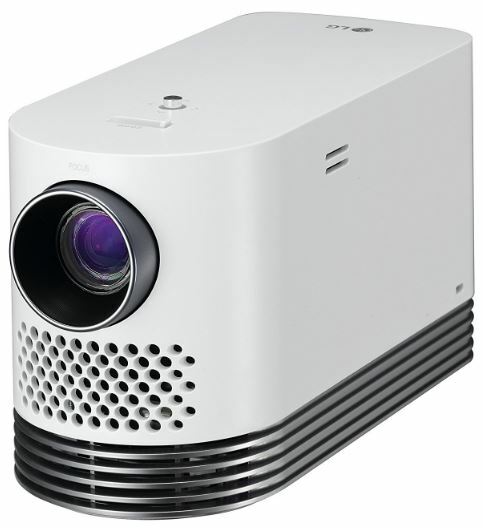 The main reason that LG included these features was because the same laser technology is used in a few of the projection TVs they sell overseas, so it made sense for them to include it here. Aside from the built-in tuner, you are able to connect standard hardware as usual. There are two HDMI ports provided, two USB ports so you can load files directly off external storage, and pass-through optical audio. If you were just looking at the specifications, you might not think that there is anything special about this projector. 1080p, 2000 lumens, and a maximum image size of 120.” This is pretty standard, if not a little low for the price range. But once you see it in person, you’ll quickly realize that it is significantly better than similarly spec’d models. For starters, the image is razor sharp. Remember, standard projectors use multiple LCD screens, each of which are combined into a single image. It’s incredible how accurate this can be (especially considering that these tiny screens are usually only an inch or two diagonally) but they will never line up perfectly. But with this model, the image is much sharper. We’d even say that it’s laser sharp. Literally. You do need to focus it, and the focus ring is much more precise than a standard projector. But once you get it where you want it to be, the image looks just as good as what you’d get from an LED television. Next, there is the brightness. Of course, there are many projectors that output 2000 lumens, and many even higher. But standard light refracts. On a DLP projector, it has to travel through a prism, through three different screens, through another prism, then finally through the lens. By the time it hits the screen, the light has been diminished significantly. Laser projectors only send the light through the lens, then directly onto the screen. By nature, laser light doesn’t refract as much as standard light. This is why a $2 laser pointer can still create such a precise point. The end result is an image that looks several times brighter than your average projector. Finally, let’s take a look at the color. The color this projector produces isn’t exactly accurate, but it’s incredibly vibrant and enjoyable. We’d compare it to the OLED screens used on modern Samsung phones. It’s fantastic for watching movies or television, but might not be the best choice for photo editing. One of the unfortunate realities of projection technology is that they do require some maintenance. Bulb projectors typically last around 500 hours, but laser is a significant improvement. This model will last about 20,000 hours. Even if you were to use this projector for 8 hours per day, you’d make it nearly 7 years before you had to replace it. This is definitely on the high end for the life cycle of media technology, so we don’t see this being a problem for any users. Many projectors come with built-in speakers. Very few projectors have speakers that are worth their salt. The HF80JA is the exception. There are two tiny 2 watt speakers built right in. While they don’t have a lot of bass, we were surprised at how well they performed. Speech and even music was clear and audible, and this would certainly do in a pinch. If you’re looking to connect external speakers, there are a few options available to you. You can hook up any Bluetooth compatible speaker through the Bluetooth out. It works flawlessly, and supports everything from portable speakers to headphones and even Bluetooth AV receivers. You can also connect up wired devices. This can be done through the optical pass-through port, or the 3.5mm aux jack. For some, the 120-inch display size may be considered a limitation. There are projectors on the market that go up to 300 inches in size. 300 inches may be a bit extreme (your typical garage door is around 220 inches) but there are a number of users who like to take advantage of screen sizes in the 130 to 170-inch range. If this is the size you’re looking for, you might have to wait a while for laser technology to evolve. Ever since the first rumors of laser projectors hit the market, we’ve been excited to try them out in person. We did have the opportunity to experience earlier models, but their incredibly high prices made them prohibitively expensive for most consumers. LG’s HF80JA is the first model to market that was affordably priced. For the first time, we’re finally able to review something that we feel is a good option. With laser projection, you can experience an ultra-crisp image that goes beyond what you thought possible with a projector. 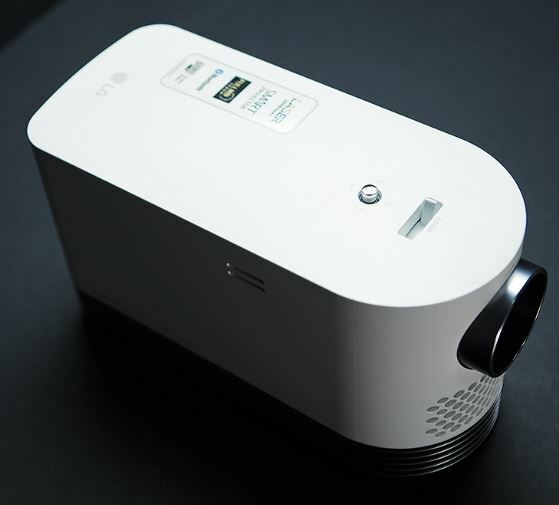 Combined with the brightness and plethora of connectivity options, LG has offered one solid projector. This is clearly going to make a dent in the market, and we’d expect to see this technology much more often, as we move into the future. The only real issue you may encounter involves the audio. To truly get a cinematic experience, you’re going to want to use a high end set of speakers. Many of you already have a home theater system in your home, and it would be ideal to use this. If your receiver isn’t Bluetooth compatible (this is still a pretty premium feature) you’re going to need a way to get connected. In our setup, we used a Bluetooth Audio Receiver. These devices are simple in nature. Connect your RCA audio on the back, and stream sound wirelessly. If you’re looking for a projector that will last you many years, it might be a good idea to stick with a 4K model. Within two to three years, we expect 4K to be the new standard. In this case, we’d highly recommend checking out the Epson Home Cinema 5040Ube. It will run you a little more money, but in the long run it could very well pay off. Question: Can this be turned upside down and mounted from the ceiling? Or is there a way to mount it right side up from a ceiling mount? I could not find that information in the specifications. 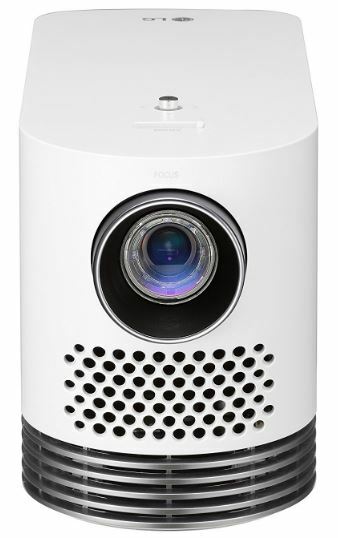 How come the XGIMI H1 DLP 1080p projector which only has 900 lumens can project up to 300 inches screen and this LG Probeam which has 2000 lumens can only project up to 120 inches? Laser project like Sony MPCL1A does not need focusing at any distance because its a laser projector, why does this LG Probeam which claims to be laser projector needs focusing? Are they misleading with their specs?